On December 22, 2011, after a year-long battle, a bill to regulate abortion clinics (Senate Bill 732) was signed into law by then Governor Tom Corbett after passing the State Senate (32-18) and House (151-44) a week earlier. This was in response to the atrocities uncovered with abortionist Kermit Gosnell and mandated ambulatory surgical regulations on abortion clinics – making these abortion clinics have to follow the same rules as any other surgical facility in the state. Despite the abortion industry furiously fighting back, by God’s providence through several circumstances and the work of the Pennsylvania Family Institute in the halls of the capitol, in the end, the strong abortion clinic regulations passed into law. Five abortion clinics closed in 2012 as a direct result of the passing of this law. A total of seven abortion clinics have closed since 2012, the latest being the Hillcrest abortion center in Harrisburg, which failed multiple health and safety inspections that were mandated by this abortion clinic regulations law. In 2011, there were 22 abortion clinics in Pennsylvania and 36,280 abortions were reported by the PA Department of Health. In 2016, the latest reporting available, abortion is down to 30,818. That’s a difference of 5,462 abortions – a 15 percent drop in just five years. There can be many factors to this drop but there’s no question the 2011 law played a significant role in saving lives. Without your help, the teeth of this legislation would not have been included and those seven abortion clinics may still be in operation. How many more lives would have been lost as a result? Your partnership with us saves lives, continuing to educate and activate pro-life policies that advance our state towards cherishing life at all stages. 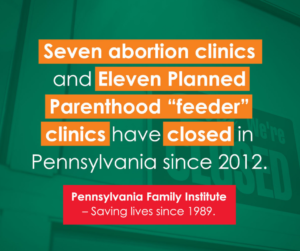 Yes, there is victory in fewer abortion clinics but there are still 30,000 abortions performed annually in Pennsylvania – and Planned Parenthood is threatening to perform more abortions in the state. With your help, we will continue to push back and help save more lives. To learn more about the life-saving work of the Pennsylvania Family Institute and to partner together, visit pafamily.org/savelives.